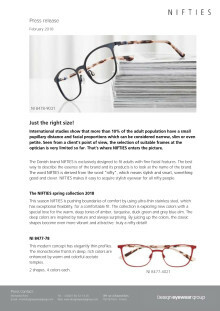 The Danish brand NIFTIES is exclusively designed to fit adults with fine facial features. special love for the warm, deep tones of amber, turquoise, duck green and grey blue elm. enhanced by warm and colorful acetate temples. 2 shapes, 4 colors each. making any condition of wearing possible; even under a racing helmet. Temples are in colorful acetate to enhance the spirit of sport.